Two Tibetan bears which were illegally transported in the northern city of Haiphong have been rescued and then handed over to Cuc Phuong National Park. 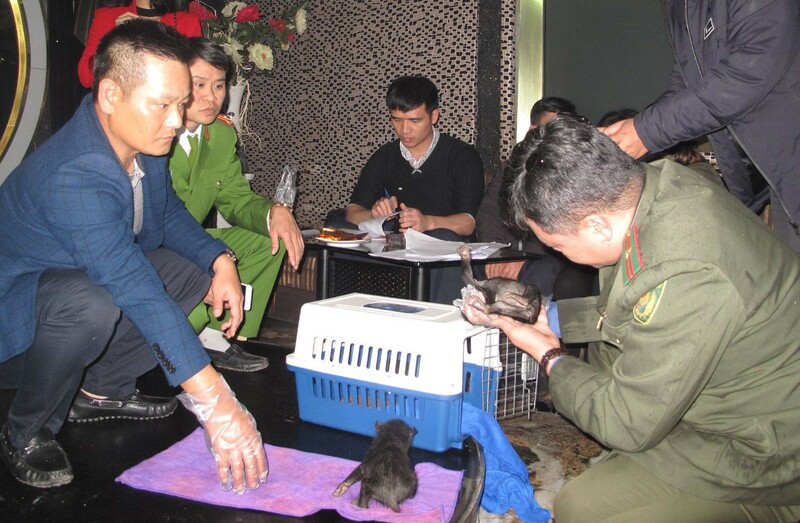 Haiphong police on Tuesday found two Tibetan bears at a café shop on Lach Trach Street, Ngo Quyen, after they had been brought there by Kieu Thuy Hang, 28. At the police station, Hang confessed that a woman hired her to carry the bear to the café and then give them to a female customer whose name has not yet been defined. Hang was promised to receive the payment of VND50 million (USD2,173). Hang called a taxi to bring the two bears held in an iron cage covered by a bag. However, the trick was discovered by the police. Experts from Our Paws Viet organisation came to Haiphong after being informed of the case to provide medical examinations for the animals. The bears which belong to rare animals needed to be preserved, weighing around 900 grams each. Emily LIoyd from Ninh Binh Bear Sanctuary said that the bears showed signs of dehydration due to acute diarrhoea. After being treated, their health has seen improvement. Haiphong police have continued investigating the case.